Cocklebur or Burdock—What's the Difference? Common cocklebur (Xanthium strumarium L.) and common burdock (Arctium minus) are members of the sunflower family. Both plants have bur-like seed heads that are easily spread by clinging to human clothing and fur of domestic animals, wildlife, and livestock. Although the plants share similar habitat and are both widely distributed across the United States and southern Canada, cocklebur tends to flourish in regions warmer than where burdock grows (Figure 1). Figure 1: Distribution of common cocklebur (left) and common burdock (right) in the United States (EddMapS 2017). Cocklebur is native to the United States and is primarily a weed of riparian areas, pastures, disturbed areas, and cultivated cropland. Burdock was introduced from Eurasia and likely reached North America with early English and French settlers. It was considered widespread in Pennsylvania by the mid 1800’s and is now naturalized throughout North America. It is found primarily in riparian sites, pasture margins, and natural areas; however, it is not problematic in cultivated land. Common cocklebur and burdock differ in their life cycle, growth form, flower type, and seed heads. The following information compares differences between the two weeds. Cocklebur (far left): Annual plant that germinates and produces seed the same year. Photo by John M. Randall, The Nature Conservancy, Bugwood.org. Burdock (left): Biennial (sometimes short-lived perennial) plant that germinates and spends the first growing season as a rosette, producing a flower stalk and seed the second growing season. Photo, Steve Dewey, Utah State University, Bugwood.org. 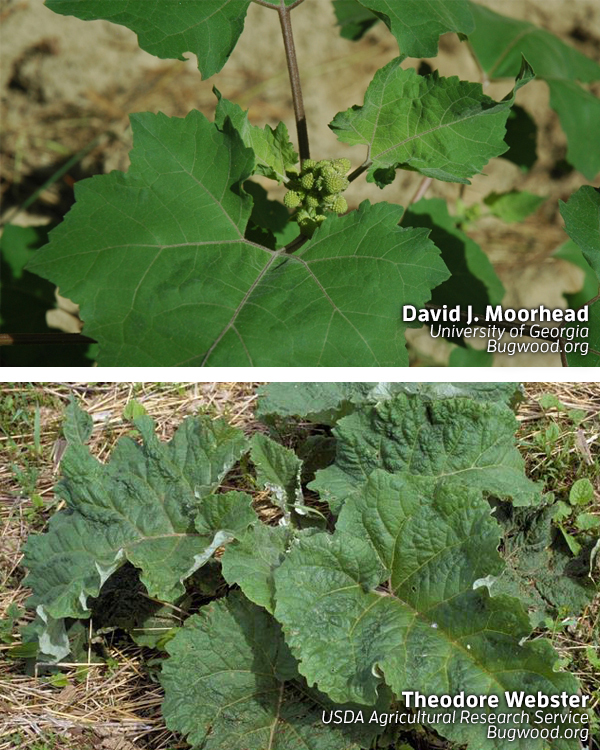 Both weeds are tap rooted; however, burdock is more robust with larger leaves. Burdock: From three to more than six feet tall, depending on growing conditions. Cocklebur (top left): Leaves are about two to six inches long, and both surfaces are covered with minute, hair-like projections that are rough to the touch. Leaves have three prominent veins on the upper surface of the leaf that arise from the same point. Photo, David J. Moorhead, University of Georgia, Bugwood.org. Burdock (bottom left): Leaves are dark green above and whitish green and woolly/hairy beneath with margins that are toothed or wavy. Basal leaves are large, up to 14 inches across and 18 inches long, resembling rhubarb. Lower leaves may have hollow stems. Photo, Theodore Webster, USDA Agricultural Research Service.Buwood.org. Cocklebur (far left): Plants have purple or black markings on the stem. Photo, John M. Randall, The Nature Conservancy, Bugwood.org. Burdock (left): Stems are thick and ribbed, without purple or black marks. Photo, Steve Dewey, Utah State University, Bugwood.org. Cocklebur (far left): Separate male and female flowers are brownish white and green, respectively. Male flowers are uppermost on the plant axis. The seed pod or bur is one complete flower head containing two female flowers. Flower heads form in leaf axils and at the ends of branches. Photo, John M. Randall, The Nature Conservancy, Bugwood.org. Burdock (left): Perfect flowers (both male and female parts) that are lavender to pink. Flower heads form in leaf axils and at the end of branches. Individual tubular flowers are surrounded by bracts and hooked spines, making the seed head into a bur. Photo, Theodore Webster, USDA Agricultural Research Service, Bugwood.org. Cocklebur (far left): Bur is green, maturing to dark brown in color, and contains two black, flattened, ribbed seeds. 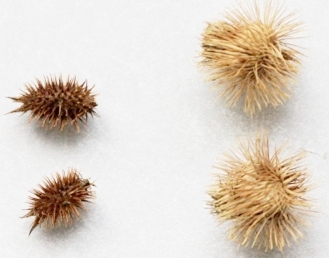 Burs are football-shaped, about 0.5 to 1 inch long x 0.3 to 0.6 inches wide, covered with hooked prickles. There are two curved spines at the tip of each bur. Burdock (left): Each seed pod or bur is grayish green, maturing to light brown in color, ball shaped about 0.5 to 1 inch in size, and contains from 20 to more than 40 seeds. Photo, Celestine Duncan.